There are so many fancy claims about apple cider vinegar these days, (or ACV if you are in the know) you’d think it could bring about world peace. I have found lists of nearly one hundred uses for the centuries old stuff and the ideas are endless. If you were to ask Hippocrates (400 B.C. the father-founder of modern medicine), he would say vinegar was an essential curative. He used it for a vast number of “medicinal purposes” in the days when there were no medicines. 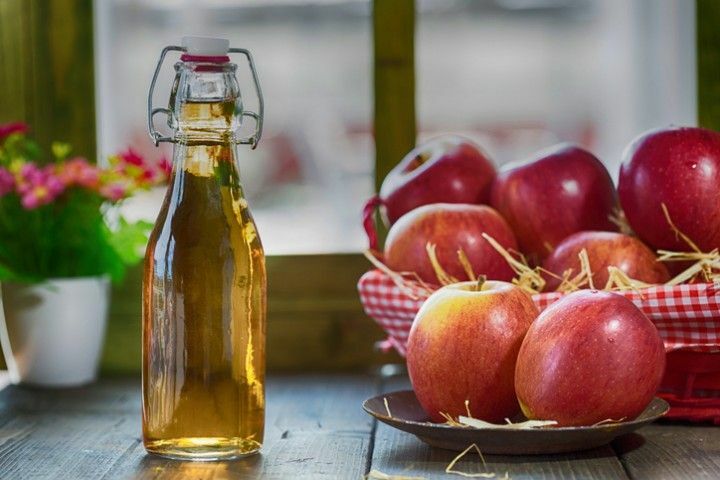 Apple cider vinegar is made by a two-step process. It starts out with the mash and juice of the touted “apple a day keeps the doctor away” ingredient. Crush those apples and you have a nice vat of apple cider. You can drink that sweet sugary drink at stage one and be deliciously happy. Stage two is to add yeast. Voila, the sweet sugars convert to alcohol (like wine), and it becomes hard cider, you can drink it at stage two and be even happier. Stage three is to add bacteria which converts the alcohol to acid, making what the French call “sour wine” or “le vinaigre”. You might think stage three is a bummer, but now we’ve made one of the most versatile elixirs in the world, making us happier in the long run. I always keep a huge jug of apple cider vinegar in my house. I use it as an antibacterial to clean surfaces like windows and tile and as a strong acid to kill weeds in my garden. It fixes dye keeping black clothes black and Easter eggs bright. But more importantly there are a lot of health claims about apple cider vinegar too. Many of these claims are not fully backed scientifically, but there is some good research is out there. Several interesting studies suggest that ACV can actually work to interfere with the absorption of sugars. I found this very interesting because one of Hippocrates’ theories is that cures can be effected by opposites, SO since vinegar seems an opposite to sugar, this makes sense to me. It also has a satiating effect so you feel full when you consume foods with vinegar. The end result is the claim that ACV can help manage diabetes and obesity. Another study showed that it made cancer cells vulnerable, and that it was beneficial because of its antioxidants and polyphenols, reducing inflammation and preventing cell damage. NO ONE can tell you exactly how to do this by the numbers so I will give you my theory, just keep some “cider beside her” and add it to lots of things. I think it’s great in salads, it is the base of pickles, it brightens soups, vegetables and rounds out the flavors in grains and savory dishes. More creatively you can add it as a “shrub” to cocktails and in the case of Salty’s chef’s this month you can even add it to desserts. There are so many great ways to enjoy cooking with “le vinaigre” see what great tips “le Chef Jeremy” has for you right here in his latest blog. Check out these links for more cider facts!